Mediterranean Sea, International Waters, North West of Palestine. Zaytouna-Oliva is continuing as planned on her route to Gaza, Palestine, where our sisters and brothers are preparing for her arrival. Participants aboard the boat are busy conducting interviews with media outlets to further increase awareness of their trip and the illegal blockade. According to Mairead Maguire, who was awarded the 1976 Nobel Peace Prize: “We sail to Gaza, a 7-day, l,000 mile journey, because our love for all the suffering children is as deep as the Mediterranean Sea on which we sail … As in Gaza, so too around our world millions of children are suffering because of government policies of militarism and war and violence of armed struggles, etc. and this cycle of escalating violence must be broken, lest it spin out of control and cause final disaster for the human family… it is not too late, we can turn around from war to peace, from foes to friendship, from hate to forgiveness and love, it is a choice. We are powerful each in our own way. We can, when we believe passionately in love, change to a non-killing, non-violent world. Mediterranean Sea south of Crete (Greece): During a storm a few nights ago, part of the rigging on the Zaytouna-Oliva was damaged by heavy winds. Although the damage was minor and she continued to make good progress for the last few days under motor towards the Greek island of Crete, she still needed her rigging fixed in order to continue the mission. This morning our friends from Ship to Gaza Greece sent a repair boat which brought a skilled rigging specialist to repair the damage, as well as bringing more fuel and supplies. 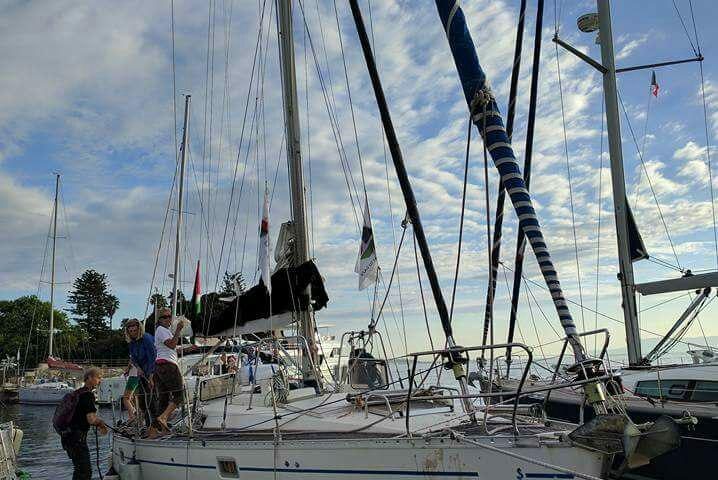 The Zaytouna-Oliva is now continuing on her way to break the illega blockade of Gaza, with many thanks to the solidarity and friendship from Greece! She is scheduled to reach the shores of Gaza later this week. Photo credit: Kia Ora Gaza (New Zealand/ Aotearoa). The following is a compilation from the Captain, crew and participants on the boat. We had heavy showers and several women are seasick. There were not many takers of the cous cous salad we had for lunch. But our discomfort at sea pales in comparison to the people of Palestine. Today has been easier and we are enjoying calm conditions. We are sitting together enjoying the noon sunshine. It is nice to see everyone smiling and finding their sealegs. Women are singing “I am sailing to be near to you”.